Ok before I continue, let me say that this is my own personal take, the way I see things, what I do. This is not an alternative to seeking professional medical/nutritional/health advice. If you follow the advice on this blog then you do so at your own discretion/risk, it’s your own responsibility (do you remember when that was normal practice?! Old skool hey). If you eat nuts because they are (normally) good for you and I have recommended them, don’t come crying back to me (or try to sue me) because you have a nut allergy. All I can say is that I am 54 years old and fitter & healthier than most people I see around me that are half my age. I have personally passed the HBT Active Body Challenge (see Active Body Challenge on Home page) – can you or anyone you know? (now there is a challenge and a goal worth pursuing!!) I am neither anorexic nor obese. I have no allergies, heart problems, asthma, blood pressure problems, back problems, skin problems or any of the other problems that seem so prevalent today. I am what should be the norm. I think I aught to start with a beginners guide to nutrition, inspired by this picture that appeared on my facebook page. Obviously the ‘postee’ was trying to show that their perception of food was different to yours. They saw food in calories. This was because I was lucky enough to have learnt the difference between food – nutritionally beneficial edible (normally naturally occurring) substances, and junk - edible substances designed to appeal to our sensory receptors (see above). 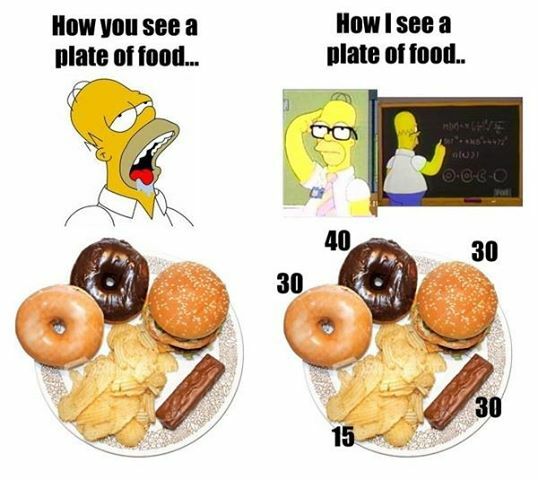 Numbers/calories aren’t important, it is what you do and don’t put in your mouth that is important. The biggest problem with the obesity crisis at the moment is that we are being fed (visually and orally) by the big corporations, who, driven solely by monetary gain cannot just offer us naturally nutritious food such as a cabbage in a box at a great profit to themselves, and so must alter the natural nutritious raw product to it’s detriment , or even synthesis one from scratch that is ‘their own’ brand. There is a saying “ It goes in one end and comes out the other” – this is a subtle misconception. Does it matter? Unfortunately it does. You have to learn to choose what you put in your mouth by what it does for you, not what it looks like or tastes like. Ok, there are 3 types of food. Carbohydrates, Proteins, and Fats. Carbohydrates are fuel for the body, like petrol in your car. Proteins are the building blocks of the body, like the bits that go to make up your car, the plastics and metals that are moulded into doors, seats, wheels etc. Fats are divided into two halves - approx 90% bad, 10% good. The bad fats are emergency stores of fuel, like canisters of petrol we store in the boot of the car. Good fats are like the oil you put in the car engine to make sure it runs smoothly. Carbohydrates – the more you take on board the more moving around you have to do to burn it off or use it up, just like the car when you fill the tank. If you don’t move sufficiently before putting in more fuel then the fuel is stored away for later, like the canisters in the boot of the car. Keep adding fuel, keep adding and carrying around more canisters. If you look around you now, you will see that two thirds of the population are carrying round loads of these (two thirds of the UK population are obese ). Proteins – as well as building up and repairing your body, proteins can also be used as fuel. The body can convert them to fuel. It cannot convert carbohydrates/fuel to building blocks. From the above, logic would suggest that as we have a limited capacity to consume fuel without building ever increasing stockpiles (like a hoarder gone wild), unless we lead very active lives, (and even then) we should be very wary and choosey about what we put in our mouths. When beginning the journey of enlightenment, my first suggestion is to start reading the food labels (Invariably you will be eating those types of food or you wouldn’t be taking my advice, though eventually you will hopefully be purchasing, preparing and eating more natural foods – fruit, vegetables, fish etc that don’t normally come in packets and tins – but one step at a time). The benefit to this is that you can start to regulate your intake of fats (canisters of spare fuel), especially saturated fats. The official target is to keep saturated fat intake below 2%. I personally try to get rid of it altogether, because you cant, and this keeps the overall total down. Saturated fats have no nutritional value, and as well as having to carry around this extra stored fuel, some of it on its way to storage helps to raise your level of cholesterol in the blood which increases your risk of heart disease. So no plus points only minus points. If you see trans-fats or hydrogenated fats on the label don’t go there. Though trans fats occur naturally in beef, lamb and full fat dairy products, these should be your only source. (Processing liquid vegetable oil to become solid fat in a process known as hydrogenation, [trans fats] changes the chemical structure during the process, and these trans fats have a negative effect on the body. Like saturated fats they increase bad cholesterol, but they also lower your good cholesterol – a double whammy). Ok, more potentially disappointing news. Two major suppliers of saturated fats don’t have labels for you to read. Another big supplier of saturated fat (as well as sugar, salt, and bleached wheat dust – more on this later) comes unlabeled in the bakery section. The pies, pasties, bread, cakes & cookies etc that we point to and say “I’ll have one of those and two of those” are a hidden minefield. We have to think back to bakery classes – if we’re lucky with Mum or Gran, if not then at school – making pastry. Think back; flour, water and lard/butter/margarine (take your pick). A big wedge. Saturated fat. You have to learn to disassemble what’s in front of you into its component parts. (If its not natural – a piece of fruit, veg etc). Talking of which, whilst we are on the subject of pastry/bread – flour. I will only ever eat wholegrain/wholemeal bread (when I do eat it) and I stay away from the other pastry produce because they don’t offer this wholegrain option. The flour they use to make your pastry is beaten to death, bleached and all the nutritional content removed. (No, brown bread IS the same as white bread only with added caramel colouring. Only wholegrain/wholemeal is different). Because of this they add some token vitamins, which as it happens, because our bodies work in synergy, causes our bodies to draw on nutrients already within the body to use to synthesis these isolated vitamins, thereby doing us more harm than good. This happens a lot in the food industry – for that is what it is. Misrepresentation and sleight of hand to make you believe that you are getting something that you’re actually not. Trying to find a wholegrain/wholemeal loaf is becoming such a chore. You have to ignore what the packaging says (seriously) and go straight to the ingredients. It has to say whole grain or whole wheat flour. Not wheat flour, not soya flour (which is getting into everything now and is generally GM soya), not seeded flour (though you can get seeded wholegrain), not 50% wholegrain etc. Plus you’ll be surprised what other ingredients they can add to the three ingredients above, needed to make a loaf. If you have the option or opportunity, get yourself a bread-maker and make your own wholegrain loaf. Once you are used to the nutty taste, the white bread like in the picture above tastes so sweet (see how much sugar they put in) and insubstantial. So, carbohydrates, proteins & fats. Lets look at proteins, your building blocks. There is a hierarchy of protein sources based mainly upon levels of contained fats. The top echelon includes fish: tuna - high protein (but don’t eat in excess because it may contain traces of mercury), oily fish like mackerel & wild caught salmon with their good oils (omega 3 & 6), other fish and sea food like prawns and squid etc..
For the rich and lucky next would be venison and wild game (we wish) allowed to roam at will eating natural food and producing high quality lean ‘meat’. Just beneath this comes poultry & eggs. Then lamb and pork, (which contain the most saturated fats – I personally very rarely eat below beef). The more naturally reared and fed the better. So organic (because you have less chemicals in the equation – though you still have the ‘veterinary’ chemicals). Free range to allow for more natural growth and movement as well as the potential for a more natural diet (chickens scratching for bugs etc), and naturally fed - grass fed beef for example (again less chemicals and more of their natural diet). Here is an extract from wikipedia on the comparison of grass fed beef and more commonly grain fed beef to show some of what I am getting at: quote “The omega−6 to omega−3 ratio of grass-fed beef is about 2:1, making it a more useful source of omega−3 than grain-fed beef, which usually has a ratio of 4:1. You can extrapolate this across the whole ‘meat’ industry – you are only as good as what you eat. This goes for your food supply as well, it is only as good as it’s own food source. Eat as best you can. Protein isn’t exclusive to ‘meat’, some vegetables also contain protein. The advantage of vegetables is that although they contain less protein, they normally contain little saturated fats. Another curious piece of information is that the combination of baked beans on toast also has more iron content than steak! Next up with approx 3% are the following: Asparagus, cauliflower, broccoli, brussels sprouts, artichoke, watercress, & sweetcorn. Fats. Are all fats bad for you? No. Some fats are good for you and are essential for the smooth running of your body. Just like the engine oil in your car. The two biggies are omega 3’s and omega 6’s. Found in the likes of fish (wild caught salmon have both as well as protein). These are important as the body is unable to synthesis these for itself. Omega 3’s are (basically) the fish oils along with flax seed oil. So make sure you get plenty of fish and a dose of flax seed oil ideally on a daily basis, either in liquid form or as ground flax seeds sprinkled over your food. Your omega 6’s you get from the likes of poultry, eggs, avocados & nuts as well as your flax seed oil, (linseed oil). One thing we have only touched on are vitamins. I recommend my clients and friends to take a multi vitamin supplement. Similar to the grass fed versus grain fed beef previously, you can only get out what you put in. The ground is like a soup of vitamins & minerals. Lets say we take a square plot of this land and we plant some carrots. For ease of illustration lets say that carrots soak up the vitamins & minerals (or components thereof) A, C, & E from the ground. Next year though there are fewer of these components we still plant carrots, and the next, and on. Ok crop rotation I hear you call out. So after 5 years we rotate to say turnips. Again for arguments sake turnips soak up vitamins & minerals B, D & F.
Ok, cool. So now we are slowly filtering out these from the soil. 5 years on we can go back to carrots right? Hmmm. Unless we put more A,C & E back into the ground we are no better off. Lets see what do we do? We add NPK fertilizers (nitrate/phosphate/potassium) – the reason for this? At the end of the second world war big drug companies making nitrates & phosphates for explosives were suddenly left with big stockpiles. So they sold them as fertiliser at knock down prices making it uneconomic to do it traditionally and correctly. They do help the plant grow, but they don’t add and minerals or nutrients. The best place to get veggies from is your own garden or allotment or as close to this as you can find for a number of reasons. First is the lack of pesticides, chemicals and poisons used by the commercial growers. Second is the ability to compost properly, using your own leftover remnants from uncooked greens, eggshells, hedge trimmings etc. A little bit of this ,a little bit of that. Animal manure. It all goes into that big soup. It is possible, when you add together the growing methods along with the modern transporting, ripening, & storing methods of fruit and vegetables to get an orange in your fruit bowl from the supermarket with no vitamin C content in it at all. Trying to guess how much vitamin & mineral content each piece of fruit or veg contains is a lottery. Please check with your doctor/medical provider if you are taking medication as in rare instances taking a vitamin supplement can affect the reaction of your medication. (tell them you want to take Berrocca as this brand is internationally known). Normally, having a good level of vitamins and minerals in the body can only be better for you. And on a personal level, as the body takes time to adjust to the levels of vitamins it is receiving and their absorption, I used to recommend a general multi vit: ‘Berocca’. A very well known effervescent brand. That was until I found a better alternative. The thing is Berocca contains Aspartame, a sweetner that isn’t very good for you. Why they put it into a multi-vit I shall never know. Hey Ho. I have kept my eye on the major retail brands and found one that has exactly the same ingredients item for item, percentage for percentage, BUT it doesn’t have the Asparteme J It is also about half the price – winner J Sainbury’s own brand ‘Energising effervescent’. Same type of tube, slightly lighter green colour. Sits next to the other brand (berocca). But read the tube label header as there are a couple of different but similar variants they sell. They all look the same other than the name at the top of the tube and the ingredients on the back. As a by-the-way Sainsbury’s also leave out Aspartame from most of their own branded products, and as it is in almost everything nowadays that’s handy to know. (Not so for other major brands/stores – Always read your labels). A quick note to those that read the label (well done) and see the likes of “Vitamin C 595% of your RDA” and start to worry about overdosing. Some vitamins are water soluble (like vitamin C) and are not stored by the body, so, it needs a regular supply to keep it topped up. As long as you don’t go mixing various different vitamin and health supplements and products together, whereby you could inadvertently build up and overdose on say vitamin A which is fat soluble, a daily boost of regulated vitamins along with your regular diet can only do you good. So what I am saying here to be clear is, pick one (1) multi-vit (see my recommendation above), not some of this stuff and some of that or one of these and try some of that, (dump the rest of the food/diet/vitamin/health/holistic supplements) just the one self contained multi-vit which will be enough to give you the edge. (unless of course you have been recommended to do so by your doctor/personal nutritionist etc). Lets get finally onto water. Firstly, most people are walking around de-hydrated. It is hard to go wrong drinking clean water regularly, so long as you don’t go drinking litres of the stuff at one go. As I said, most people don’t drink half enough. After the air we breathe, it is the most important ingredient that goes into our bodies. You can go quite a while without food, but without water we soon come unstuck. If you want to get pedantic, I would say get it as clean as you can. In the UK we have some of the cleanest water in the world. We still get the pollutants and wash-off poisons from the fields that drain into the drinking water reservoirs to various degrees and levels depending on where and when you live. In some areas the public drinking water is also fluorinated, which (despite the propaganda to the contrary) is also a poison. (They also put Fluoride into school milk in some areas – you can’t rely on the government/the system to protect you). Bottled water is basically the same as tap water, or, tap water put through a filter, unless it states otherwise on the label. Home filters will filter out most of the bacteria and sediments but not most of the pollutants or poisons (inc fluoride unless you use an ‘Activated Alumina Defluoridation Filter’ for that). To be sure of clean water you must distil it. (note: not all bought distilled bottled water is suitable to drink – read the label to see if it is drinkable). You can get distillers from the internet, ebay etc. (I got mine from ebay years ago). This may sound a little OTT, but I am just saying drink it as best/clean as you can and drink it as often as you can. Sip it, and the colder it is the easier it is absorbed into the body. Handy to know for after your training sessions. That will do for the introduction into nutrition. I hope you have enjoyed it, and found it interesting. Aim to become a little more aware of what you do and don’t put into your mouth. Read the labels, try to eat as natural as possible.